When one is harmed, all are harmed. When one is helped, all are healed. CONCERNED happen here and now, and through all time and space. I give thanks that this is done. This site contains copyrighted material the use of which has not always been specifically authorized by the copyright owner. We are making such material available in our efforts to advance understanding of environmental, political, human rights, economic, democracy, scientific, and social justice issues, etc. We believe this constitutes a ‘fair use’ of any such copyrighted material as provided for in section 107 of the US Copyright Law. In accordance with Title 17 U.S.C. Section 107, the material on this site is distributed without profit to those who have expressed a prior interest in receiving the included information for research and educational purposes. Barbara Marx Hubbard has been called “the voice for conscious evolution of our time” by Deepak Chopra and is the subject of Neale Donald Walsch’s book “The Mother of Invention: The Legacy of Barbara Marx Hubbard and the Future of YOU.” A prolific author of 7 books, visionary, social innovator and educator, she is founder of the Foundation for Conscious Evolution. Its purpose is to accelerate our conscious evolution. She is the producer and narrator of the award-winning documentary series entitled Humanity Ascending: A New Way through Together. As a global ambassador for the conscious evolution movement she partnered with The Shift Network and formed a team to co-produce the world-wide multi-media event entitled, “Birth 2012: Co-Creating a Planetary Shift in Time” on Dec. 22, 2012 – a historic turning-point event; awakening the social, spiritual, scientific, and technological potential of humanity. Currently she is developing on-line courses on conscious evolution and cocreation on the Shift Network reaching many 1000s of students world-wide. She is activating The Wheel of Cocreation as a model for social synergy and whole system shift, with examples developing in Cairo, Egypt, in Monterrey, Mexico, as well as in Chicago and Tampa, Florida. Her seminal book “Conscious Evolution: Awakening the Power of Our Social Potential” will be republished in an updated version in January 2015. Also her new “Evolutionary Testament: An evolutionary vision of the future inspired by the Gospels, Acts and Epistles,” will be published on January 2015. In 1984 her name was placed in nomination for the Vice Presidency of the United States on the Democratic ticket, calling for a “Peace Room” to scan for, map, connect and communicate what is working in America and the world. She also co-chaired a number of Soviet-American Citizen Summits, introducing a new concept called “SYNCON to foster synergistic convergence with opposing groups. She is a co-founder of The Association for Global New Thought and The World Future Society. 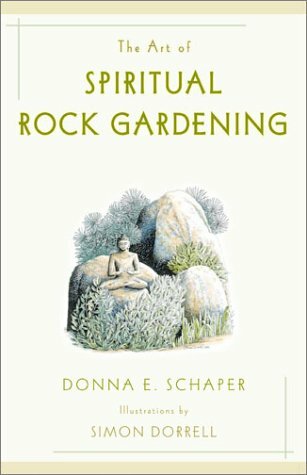 The Art of Spiritual Rock Gardening is an inspiring and practical guide for both garden lovers and spiritual seekers. The uses of the rock garden as a site of beauty, reflection and spiritual nourishment are many. Building a quiet corner of stones and plants slowly and meditatively over time is its true meaning. Process over product, journey over destination, forever a work in progress-rock is the best metaphor we have of everlastingness. From choosing the right rocks and plants to weeding and night gardening, this book shows how to start or maintain a rock garden, whether one has access to acres of land in the country or a window shelf in the city. At the same time it describes the sacred meaning of stones and rocks in many of the world’s cultures and spiritual traditions, including Stonehenge and Ayers Rock, the Western Wall in Jerusalem and the Ka’ba in Mecca, Japan’s Zen gardens, Europe’s cathedrals, America’s temples and Egypt’s pyramids. Both practical and inspirational, it will appeal to everyone who loves gardens, rocks and the transforming power of nature. Donna Schaper is currently Senior Minister of the historic Judson Memorial Church in New York City. Dr. Schaper describes the church as “a gathering place for people who seek spiritual nurture to build public capacity for social change.” Among her current projects at Judson are developing a bail-out theater and “underground economy” while also building a public ministry training program for future church leaders. The church is also the home of the New Sanctuary Movement of New York City and of Occupy Faith and is initiating a new offensive to retain access to abortion rights. Rev. Schaper has been senior minister at Judson since 2005. Schaper is the author of numerous books, most recently GRACE AT TABLE: SMALL SPIRITUAL SOLUTIONS TO LARGE MATERIAL PROBLEMS. Her best seller is SABBATH KEEPING. Other popular selections among her 31 books include WHEN A PARENT DIES and THE ART OF SPIRITUAL ROCK GARDENING and GRASS ROOTS GARDENING: RITUALS TO SUSAIN ACTIVISTS. Her articles, opinions, blog posts, and essays appear regularly in a diverse mix of media, such as The Huffington Post, the National Catholic Reporter, Sojourners and Tikkun. To learn more, visit http://www.judson.org or http://www.donnaschaper.org. where her blog Grace at Table appears as well.